The Walking Dead season 8 is going to be returning with a bumper episode. After the biting events of the mid-season finale, there’s going to be a lot of ground to cover. Not only is the episode going to deal with everything that happened with that character, it’s going to be stretched out into just shy of feature film length. According to ComicBook.com, the runtime will be a staggering 82 minutes. 82 minutes of dread, the dead and Carl’s hatless head. It’s going to be a rough ride filled with emotions, crying faces and Rick Grimes’ strained whimpers of CORALLL as his son bites the dust. Of course, how long is too long? 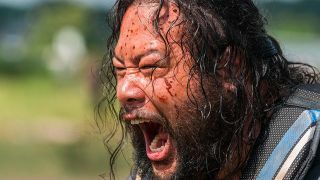 The Walking Dead has been shambling along for 18 months – with the odd bright spark here and there – and artificially elongating the episode to create a sort of ‘TV event’ isn’t going to do it any favours. Especially as the gun-toting battles and tense staredowns died a death well into season 8. There’s still hope, though. And time. Lots and lots of time. The characters are stretched out all over the place. Game of Thrones season 7 sped through a lot of the journeys just to get to the good stuff – and even then we were itching for more. The longer runtime might lend itself to some genuinely interesting developments, a sustained look at everyone without flitting quickly between people and places, and a final goodbye to Carl, one of the last remaining OG survivors from Atlanta. I still think that The Walking Dead can be a show with brains rather than just brainssss again – maybe this is a step in the right direction?